Going before the summer Olympics was decided upon, as things might be 'ruined' after this. Beijing is still a city which changes at lightning speed and might some time in the future be more similar to Shanghai, were it not for all the old cultural sights from the empire. When to go, what to see, how long to spend on each particular sight and so on and so forth..digging up a lot of info on the net, ordering yet another couple of books and a map from Amazon, then finally going via our local Kinareiser for the trip itself. 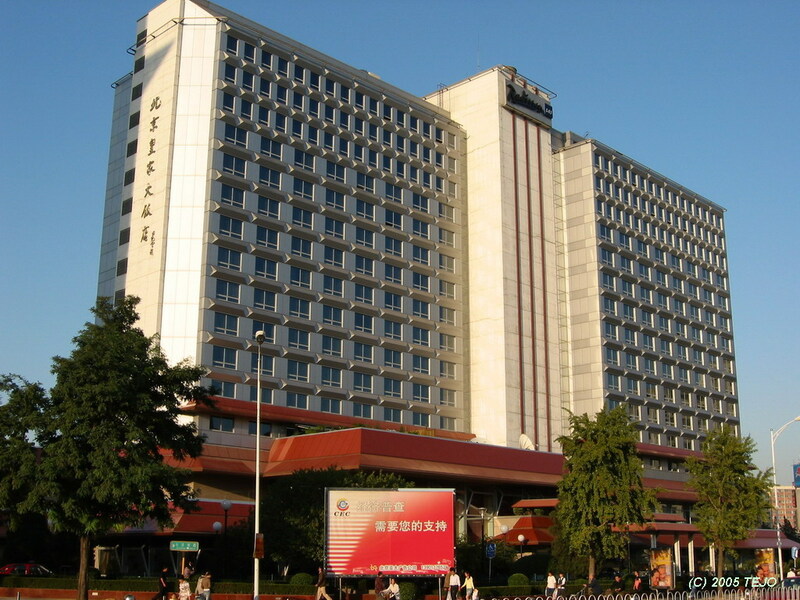 The chosen hotel was the Radisson SAS Beijing, as this is always a very good choice among somewhat more expensive hotels. An upgrade of room standard was also decided upon, as this would place us on one of the top three floors of the building, high above the expected traffic noise. I sent a request to the hotel directly to ask for some brochures, yet as time passed by and nothing arrived, I was wondering if the request had not been received or had been forgotten or ignored. I decided to contact them again and got a reply that the information had been sent already - but via ship (!) so I should expect it to arrive soon. It did indeed, just one month prior to departure, and two months after the request. As for sightseeing, a list of places to be visited was made, including a couple of less-visited places, and we decided to stay for 8 nights. We did the handling of visas on our own, as it was simple enough to send the application to the embassy, and it only took a total of 10 days to get them back in an approved state. Visa #2 now in my passport! The route took us via Copenhagen (a very short flight from Oslo - around 50 minutes on an Airbus A321) to Beijing on an Airbus A340, and even though this plane was smaller than our 747 to Hong Kong in 2002, it was still an impressive collection of metal and electronics. It roomed nearly 300 passengers, and the individual entertainment centres along with the where-in-the-world-are-we info on the big screen helped a bit on the 9 hour flight, which sped us through the night near St Petersburg, over the Urals near Yekaterinburg, past most of Siberia (the Sayan mountain range looked impressive with snow capped peaks even from an altitude of 11.000 metres), then over Mongolia before finally reaching Beijing. The night was short, as we were now 6 hours ahead of Oslo/Copenhagen time, and there was little, if any, sleep to get on the plane. I would have preferred to write that 'soon Beijing was within sight' but the flight was much longer than that, and besides, there was no Beijing to see from the air as the airport is some 30 km north of the city centre itself. 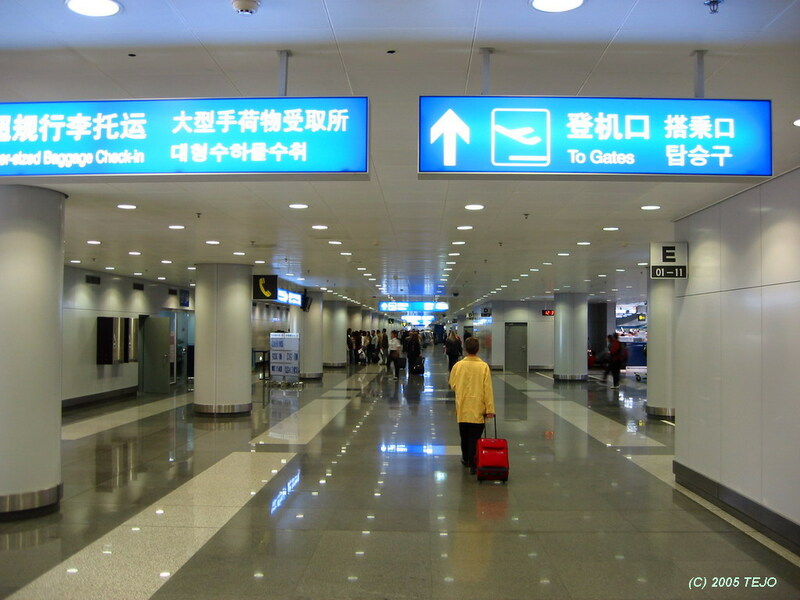 Anyway - welcome to Beijing Capital International Airport! After filling out 4 or 5 sheets of paper with important beauracratic information, it was time to aim for getting through security and immigration counters. It seemed that lots of foreigners had arrived at the same time, as the queues for the 'foreign' counters grew to tremendous lengths, while the domestic ones were nearly empty. Beauracratic government, anyone? Nope - the sent us through the domestic counters instead to increase efficiency. Once on the outside, it was time for a bit of exchange work - hmm...do we choose the Agricultural Bank of China or the Industrial Bank of China? A few hundred renminbis (RMB) richer, and we were out in the taxi queue. This seemed like a very well organised line, as there were officials watching it all and even writing down the number of the taxi we got and handed it to us, in case we should have any complaints. The driver helped build our confidence and culture shock by nearly colliding as we were heading away from the terminal (then again, near-collisions is an everyday sight in the dense traffic, as Beijing has some 2 million cars - 10% of the country's total amount). We sped southwards on an 8-lane motorway and found ourselves at our hotel entrance less than 30 minutes after we had started, reaching speeds of 110-120 km/h on the way. Our driver seemed to not speak any english when we were about to pay him, as he wanted more than the 100 RMB I offered. After accepting another 100-bill, he decided to forget about any possible change and sped off before I had the time to check if this was a 'sensible' price. After a long day and a half of travelling, I did not have the energy to bring it up either there or try to complain via the telephone number written down on the leaflet handed to us by the official at the airport - and I have a feeling this is a fact often exploited by taxi drivers there. Anyway, we had arrived at our hotel and were given a welcome drink (orange juice!) and given a room at the top floor (15)! The hotel was truly an excellent choice - a 30 square metre room with a huge bed, separate entrances to washroom, toilet and shower, two bottles of fresh water every day (as tap water was not for drinking), our own breakfast room on the 15th floor which was turned into a 'happy hour' snack room in the late afternoon where they served wine, fruit, nuts, cakes and on one occasion delicious spring rolls - all included in the upgraded room price. The hotel was also very conveniently located right next to a huge Carrefour shopping mall, where everything including the kitchen sink seemed to be on offer. Fresh food? No problem...the fish were alive and kept in tanks in the store. As we had planned beforehand, the first afternoon and evening would be spent resting and adapting to 6 hours of time shift. It was already 3 o'clock in the afternoon before we arrived, and instead of starting to search for a place to eat, we tried out one of the hotel's 3 restaurants - the Royal Cafe, which served various dishes and international cuisine. We tried an Indonesian dish, but I must admit it did not taste very good at all and was a bit of a disappointment (yet the only one we had at the hotel). A small walk in the evening around the hotel was also a good way to shake off the long flight, where we started observing local life, customs and whatnot. First of all, many parking lots were guarded by uniformed personell - at least the more expensive ones, as we had a huge bank building as neighbour. Second, there was very little street light in this part of the city (near the third ring road - out of five), and in some places the pavement was in need of repair, so we had to watch our step in the darkness. The hotel was also located near several large 'human silos' as one could call the typical grey, boring communist apartment buildings. The average Beijinger has 6 square metres of real estate, so it's no small wonder they all seem to be outside at any given time of the day, and only sleep there. Dogs have a maximum allowed size, again no small wonder as it would be more sensible to have ones that fit into your shirt pocket, if any. The first day was set aside to visiting the city's largest park and one of the major sights - the Temple of Heaven, which lies in the Tiantan park. Getting there wasn't a big challenge at all - hotel employees were on standby at the entrance/exit and would ask where you are going. They would then give you a business card where they mark the place you are planning to go to from a selectable list on one side, with the hotel address on the other side - in regular letters as well as Chinese. The back side is for giving to your taxi driver when you want to go back to your hotel. As taxi prices in Beijing were fairly cheap, this would be the chosen means of transport instead of fiddling with buses or the as-of-yet somewhat inextensive subway system. Besides, seeing is experiencing - and there's not much to see when riding on a subway, is there? After a fairly short drive to the southeast side of the city centre, we found ourselves at the entrance to the temple. 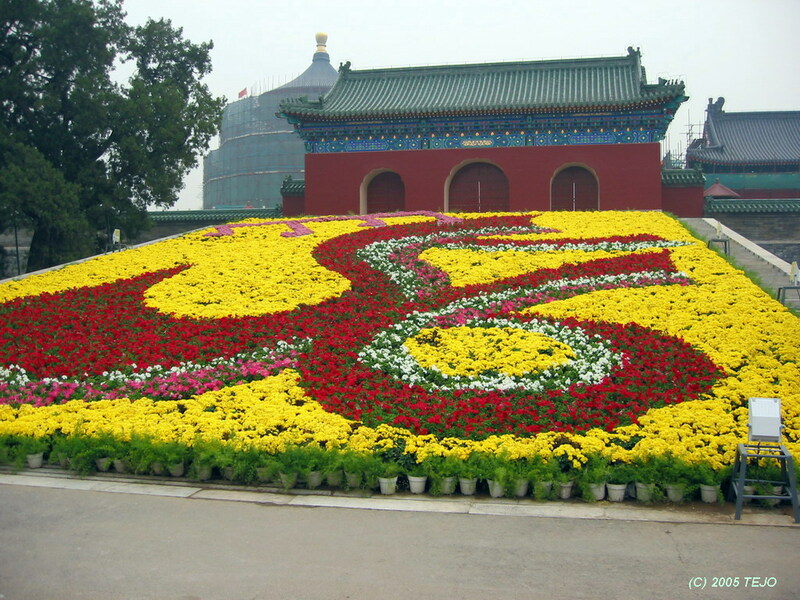 It seemed we had chosen the right time of year to visit the city, as there were several beautiful flower decorations all over, from lookalike prayer wheels to flowing rivers as well as a '56' logo, marking the newborn nations' 56th birthday. As we neared the big temple itself, known as the Hall of Prayer for Good Harvests, the first disappointment was a fact: the whole area was closed due to renovation and the top of the roof was barely visible above scaffolding and plastic covers. Still, this was the place the emperor (being regarded as the "son of heaven") came to during winter solstice , along with a huge procession of people, following a strict ritual including using a separate house for re-dressing into the correct attire before proceeding with the actual prayer. Any slight mistake in the entire process was believed would lead to bad harvests in the following year. The building dates from 1420, during the construction of the entire 'palace buildings' and stands 38 metres tall. The pillars number 12, 12 and 4 from outside to inside, symbolising the twelve Chinese traditional hours, the twelve months of the year, and the four seasons of the year respectively. It was built entirely without nails. As for the colours used (again no coincidences), red represents earth, gold is the Emperor's colour, while blue reflects heaven. Since we were unable to see the big temple itself, we had to settle for the other sights: The echo wall is said to reflect sound so well along its circular form, that if you clap or even whisper on one side, a person on the other side should be able to hear it. Naturally, all tourists tried to do the same thing at the same time, so finding out if this was actually true was impossible. The amount of tourists was also well above average, as the week beginning with the National day (1st of October) is a week off for all (?) Chinese people. Thus, many flock to the big sights. 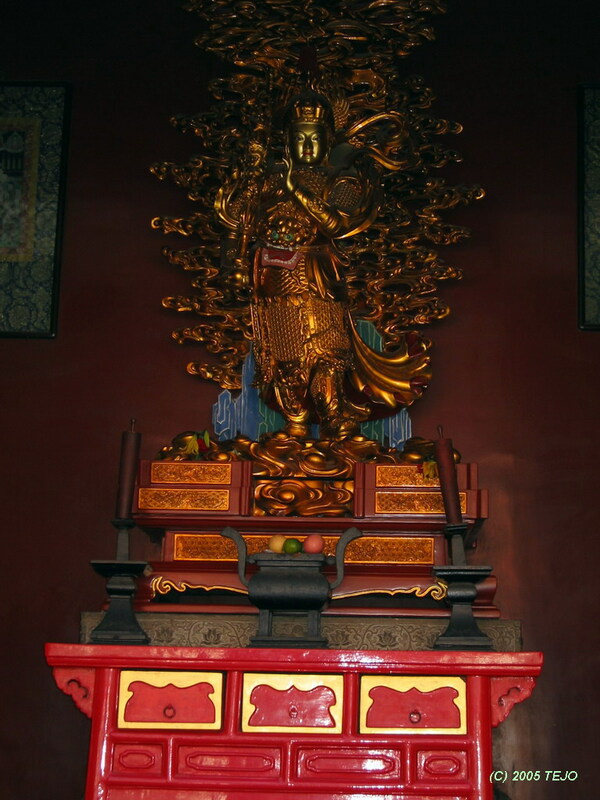 The Altar of Heaven or Earthly Mount was the site where the emperor prayed for good weather. 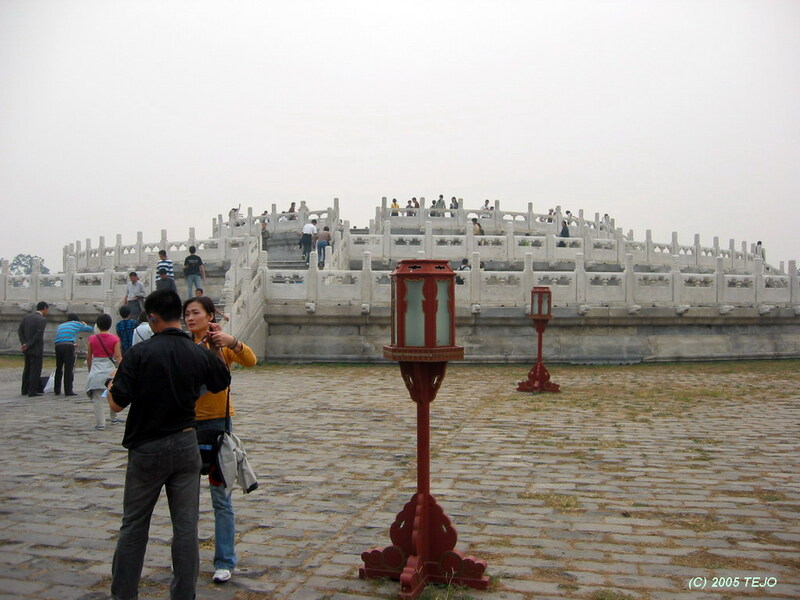 It is a relatively simple platform on three levels of marble stones, but with an amount of stone slabs on the top platform that always meets the number 9 (such as 81), which was the representative number of the Emperor himself. 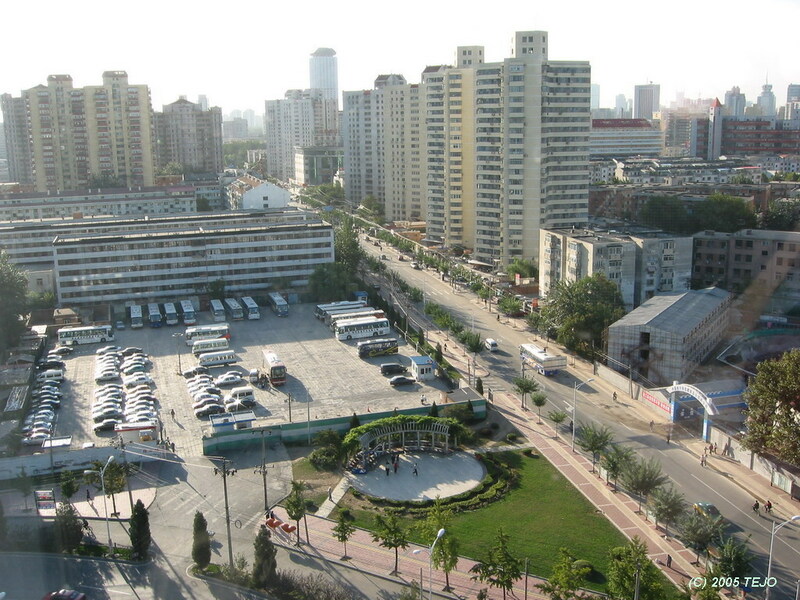 After the somewhat long roundtrip of the park, which covers 2.7 square kilometres and is the largest in the city proper, we headed on by foot towards Wangfujiang, a walk of just a kilometre or so. This is the shopping street in Beijing, as is apparent from all the neon signs lighting the area up. 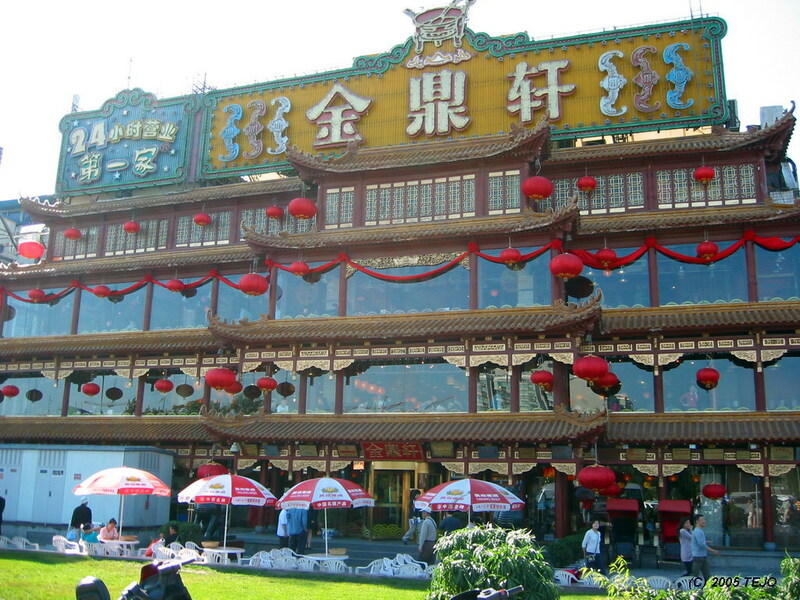 The Tianlun Dynasty hotel was easy to spot with its four matching 'pagoda' rooftops, as was the McDonalds logo nearby. After a not too long stroll along the street and a quick look inside a large 'gallery mall', it was time to head on. On the outside, we were greeted by a bit of rain as well as a Chinese art student who seemed interested in pointing us towards a gallery of some sort. This seems to be commonplace, as I have gathered from other written experiences, yet I do not know why they seem surprised when we politely decline. 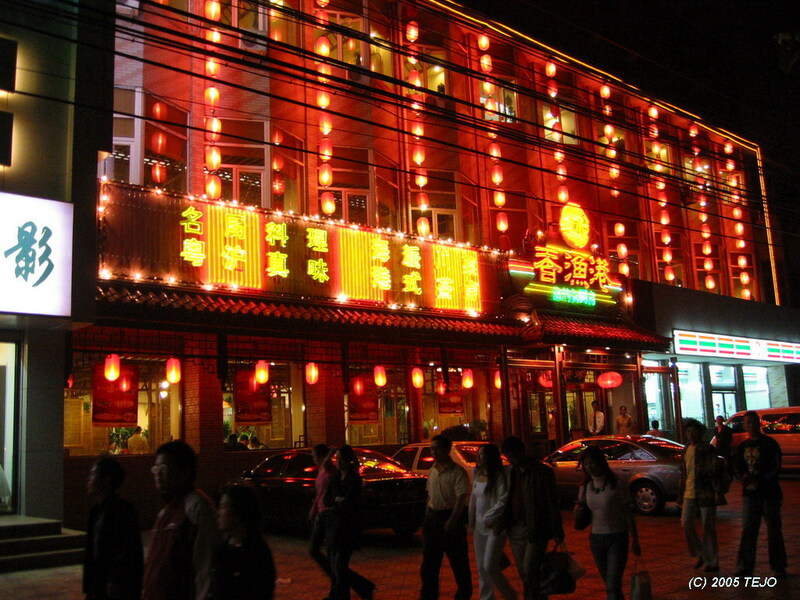 Dinner was again done in our hotel, but this time we chose the local Chinese restaurant. 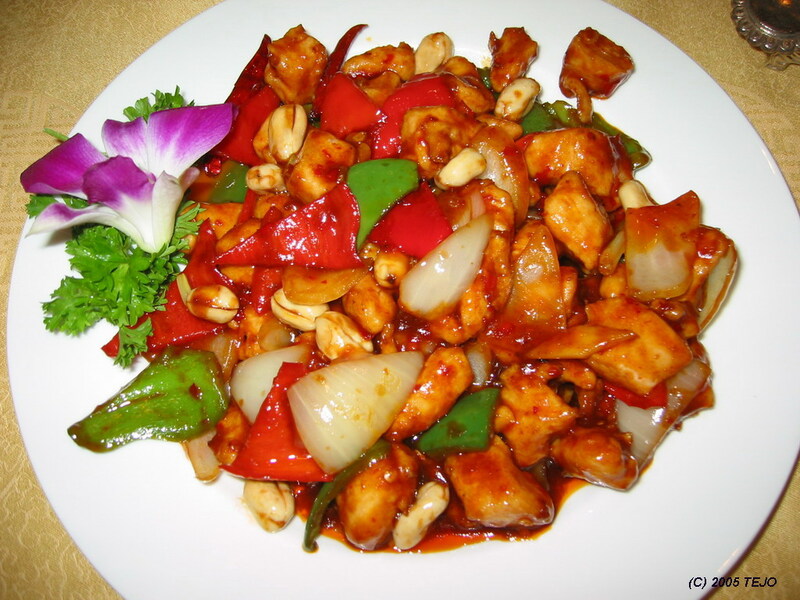 The main dishes belonged to the Cantonese cuisine actually, so we expected a hotter experience than usual. We were indeed right - the meal did not lack in spicy additions, but some good came out of it, as my mother was forced to learn how to use chopsticks, and it did go well, as we had to use such tools on several later occasions. We had decided the evening before, after looking at the weather forecast which was put up in the reception area and updated on a daily basis, to go for a package-tour to the great Wall. As the hotel had brochures from a company called 'Blue Dragon Tours' lying around, we decided to sign up for it. The hotel would then book us in on the tour and they would pick us up at 7:30 the next morning. Time for an early rise...they did come a few minutes late though, but as our guide told us we were right on time she explained they had to wait for some of the natives who were joining the tour. The tour program described in the brochure showed the following 'itinerary': visit to the Ming Tombs, Jade Factory (possibly with another visit somewhere..hmm) and then after lunch, the wall itself. Our first stop was indeed the Jade factory (or one of them). It was quite fascinating to see this insignificantly seeming stone being turned into something much more eye-catching, and this was by far the most interesting "detour" of the trip. Of course, there was ample possibility to shop till your heart's content, but that is to be expected I guess. Next up was a visit to the Ming Tombs area. 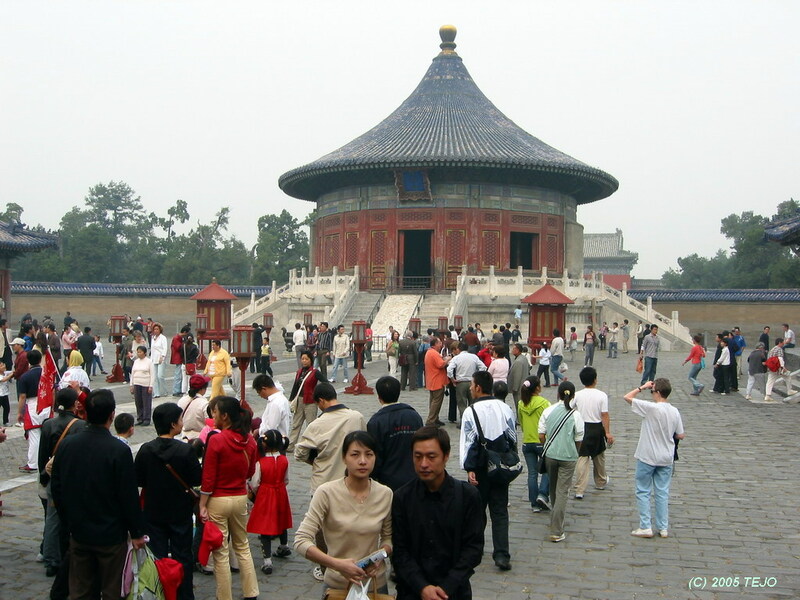 This is a large area originally chosen by emperor Yongle in the early 1400s as a mausoleum for himself and his successors. In total, there are 13 tombs here, and the site was carefully chosen, following important geomancy (Feng Shui) principles, i.e. bad spirits and evil winds from the north must be deflected; hence the selection of the arc-shaped area at the foot of the northern Beijing mountains. En route there, we passed the Sacred Way, an interesting piece of road lined with lots of statues of various beings and animals, guarding the entrance to the tomb area. Sadly, we passed by this without stopping there, but instead went to the tomb area itself, where we just visited the outside of a mausoleum (some are possible to enter). As the Sacred Way is one of the best preserved examples of art from the 15th century over here, I have a feeling this would have been a much better choice instead of the outside of one of the tombs, with just regular Chinese style buildings (of which any visitor will see plenty anyway without coming here). Near the tomb area we drove past huge fields of apple orchards, where locals sat by the road offering their products. The only thing in contrast to my previous experience from Vietnam was that this was a slightly less exotic fruit on offer. The relatively narrow road at this point was lined with trees on either side, which were painted white up to a certain level (a metre and a half above ground level). We were told this was to keep crawling insects from ascending the trunk and damage the trees. Next up - a visit to a medical centre (what? ), a bit of a surprise when reading the day program. We were given a short lecture by some local doctors who have the philosophy of focusing on natural medications (as opposed to artificial ones). They proceeded with asking where people were from, and we found out we had a pretty widespread audience. In addition to the local ones and us, there was a guy from Switzerland and a mother with two daughters from Kazakhstan. There didn't seem to be much point in asking about it though - perhaps to keep some time flowing. We then had the possibility to 'volunteer' for a medical examination, and after a very brief check, I was told I could benefit from some medications for my liver. Strange, I thought, but not when I heard the price of the medication. For an arm and a leg I would then be a happier person, and this explained why some of the locals did not even bother to come inside - this was obviously another tourist trap we were being herded into, and a pretty blunt one at that. Needless to say, I declined and said I felt in a pretty good shape. We were to leave at a set time, but had to wait something like 20 minutes extra as the Kazakhstan visitors seemed intent on shopping till they dropped. 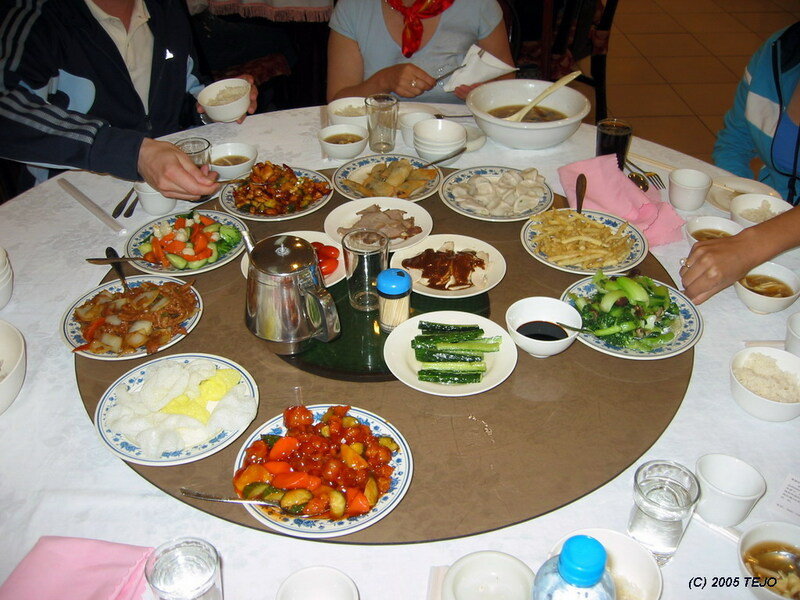 It was time for lunch, and we stopped by a large restaurant on the way towards Badaling. After navigating our way through half a kilometre of souvenir shops, we found the restaurant, which was of a very high standard, especially food wise: we were served a nearly uncountable number of dishes on a rotating table (a smart solution by the way), and although we had no chance to taste it all, it was delicious, and probably the best lunch I have ever had on a "herded day trip". During one of the sessions our guide had in the bus with describing surroundings and history, one of the locals decided to spend a lot of time on his cellular phone, and wasn't satisfied with that - he seemed to compete volume wise with our guide (who was using a microphone) and won the competition, forcing our guide to wait until the time of our local and self-proclaimed new emperor's reign was over, which unfortunately wasn't short enough. Badaling itself is a small town some 60 km north of Beijing, and as the mountains grew in size, the road started to elevate and wound its way along a gently curved valley. 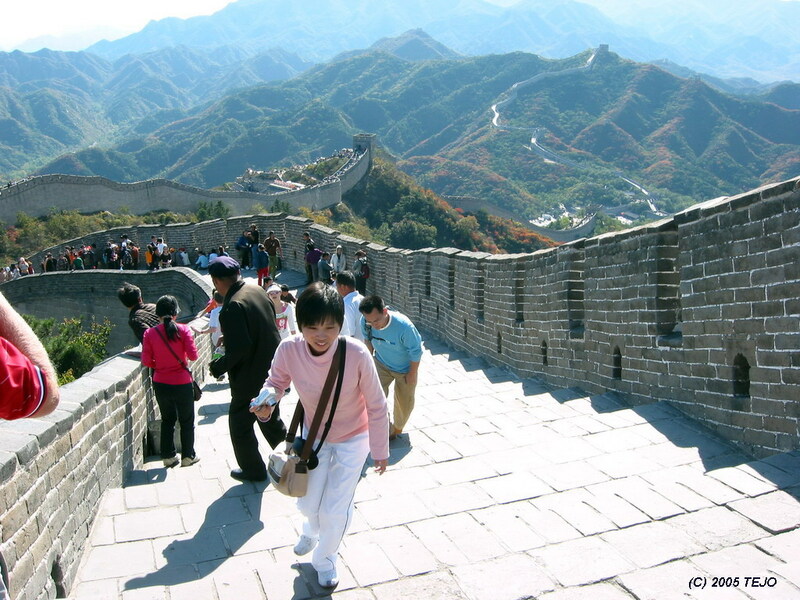 We passed the Juyongguan fortress but didn't stop there (too much time spent on tourist trapping), and even before we had gotten this far, we saw sections on the wall along one hilltop or ridge...then another...then another..in fact, the wall seemed to be everywhere around! I had previously been under the impression that the wall was mostly one infinite stretch of some 6500 km - 10000 Li, equalling 5760 km in the old Chinese measuring unit (but literally meaning infinite) with a few branches here and there. Not so - there were branches everywhere, as if the the wall was some sort of octopus construction. By the time we arrived at one of the parking lots belonging to the Badaling section (yes there seemed to be more, either different tours go to different spots, or they just go to random spots, perhaps depending on traffic), it was already afternoon. From here, we took a slow rising homemade rollercoaster-lookalike climb up to the wall proper. Finally we were there, more than 6 hours after the tour started! The wall itself was a fantastic experience and difficult to describe. You can walk as long as you want (until you have to return to your car or bus or whatever), but we found ourselves on a section where the wall ended abruptly. To continue would mean backtracking a bit, entering ground level, then crossing down and up to the next section, where a cable car system brougt visitors up from the other side of the mountains. The mountains themselves are very scenic, typical for the part of the world they are in, like frozen waves with steep sides and lots of greeneries. Badaling is the most heavily visited part of the wall, and to add to that it was national day holiday, so the wall was pretty packed with people. It was at times also very steep, and had tall steps making you wonder how many of the short-legged natives managed to navigate here. 2500 years ago, when China was split up into several smaller warring states, they built separate walls to defend themselves against their neighbours. 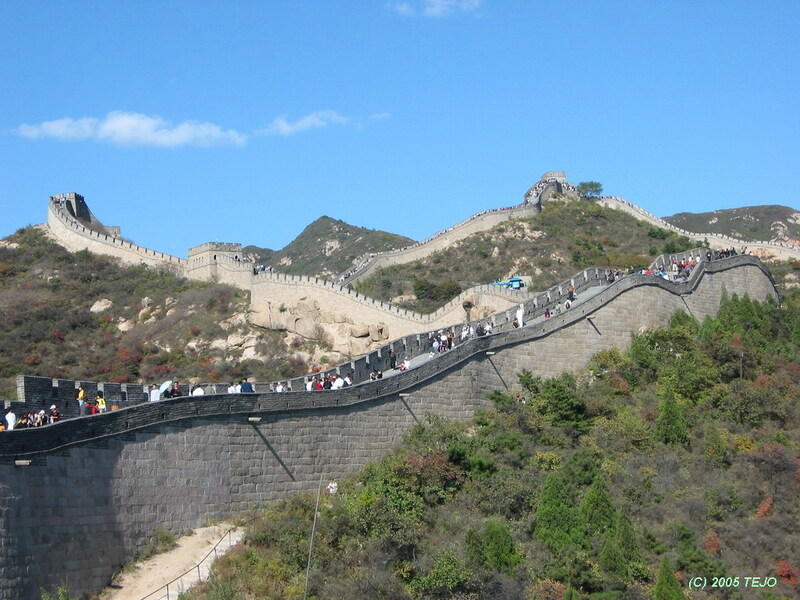 As the Qin dynasty was established in 221 BC and China was more unified, the wall was ordered torn down in some places, and connected in others, making it a continuous line of defense towards the north. As transportation of building materials was a challenge, local resources were used wherever the wall was laid - using rock in the mountainous areas, and sand or earth on the plains. Most of this wall has eroded over the centuries, and little remains of it. 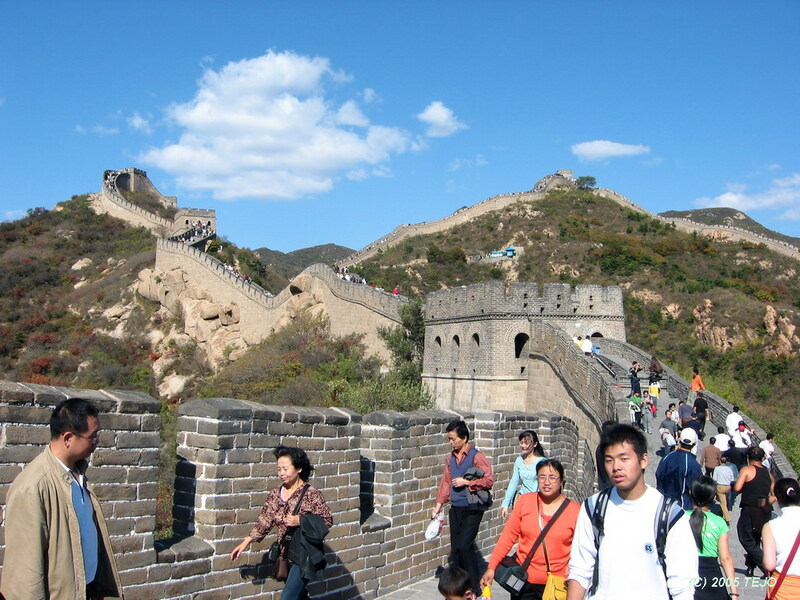 Over the course of time, later dynasties repaired, rebuilt or expanded various sections of the wall, but it was not until the Ming dynasty in the 15th century that the Great Wall was again seriously revived after a battle with the Mongols to the north. After long periods of these battles, the Ming constructed a fortified wall on their northern border towards Mongolia on the same principles of the ancient one. This "new" wall proved to be a better line of defense, as it was made of stone and bricks, and the Ming managed to hold their own against Mongol raids over the coming years thanks to putting a lot of effort into repairing and reinforcing the walls, especially near the (already then) capital of Beijing. In 1644, after several unsuccessful attempts at breaching the wall, the Manchu finally managed to get into Chinese territory thanks to a rebel Ming general, and proceeded to capture Beijing and overthrow the Ming dynasty, thus establishing the Qing dynasty. During this dynasty, Mongolia became part of the empire (the state now known as Inner Mongolia), and the wall fell again into disrepair. The obvious souvenir to get from the Great Wall (especially Badaling) is a t-shirt which says "I climbed the Great Wall", and the Chinese equivalent is also printed: "Bu Dao Changcheng Fei Haohan", a famous saying in China, as it was first spoken by their great leader Mao (Changcheng is Great Wall in Chinese by the way). The trip back down to the parking lot was much more fun than the one up, as there was (again) a sort of homemade rollercoaster ride but with a guy in the front carriage using brakes, easing us down via several well dosed curves. Back in the parking lot, there were buses everywhere this late in the day, and we felt thankful for arriving a little early after all. We were approached by a guy who at first gave us a slice of apple to feed the local bears on display in a small zoo. As he offered more pieces to give, he later asked for money, stating that only the first piece was free. Since he didn't state that simple fact straight away, I refused to give him any money, hoping there was a microscopic possibility he would learn not to trick tourists on later occasions, but instead he spat out some mixed angry syllables and had apparently decided to 'lose face'. We were told to return to the car at an exact time, yet the local Chinese who joined the tour decided not to bother too much with that, and returned nearly half an hour after the appointed time. All in all it did not seem as if they had much respect for the arrangement, or perhaps needed to make themselves visible (and audible) in a negative way (at least to our foreign eyes). After a pretty long day trip the previous day, the time had come for a more relaxing one, and we decided to pay the Lama Temple a visit. This site is not a usual part of standard Beijing tours, and we were happy that we made our own tour of the city, as the temple was a wonderful treat and a peaceful haven, almost completely screened from traffic noise thanks to high walls around the compound. 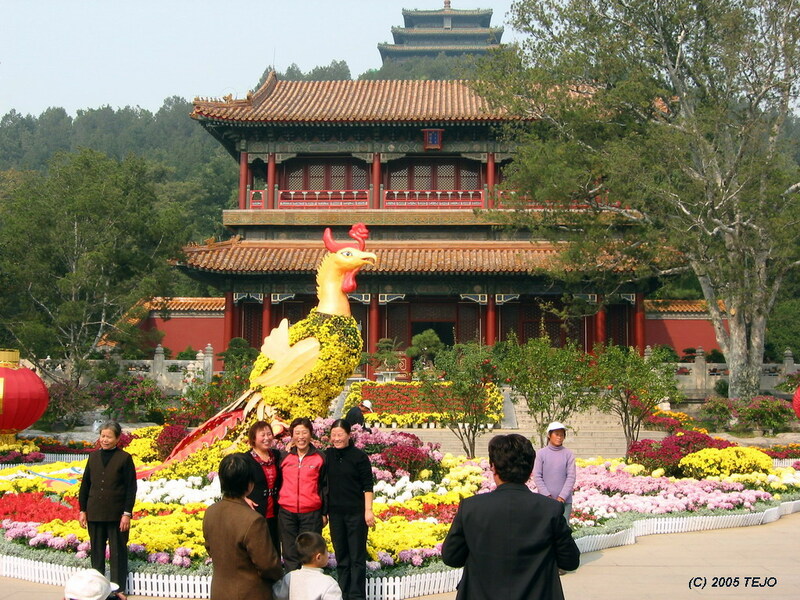 The site was built in 1694 as a residence for the Qing dynasty Prince Yong. At his ascension to the throne, the building was turned into a palace named Yonghe Gong (meaning palace of harmony and peace in Chinese). The next emperor changed it into a lamasery in 1744. It is a living temple, made apparent by the many visitors who come to light their fragrant sticks and pray. There are several large buildings along the site's 480-metre long axis, each of the major ones containing some sort of relic or Buddha shrine. From this list (and the somewhat amusing translations), the final one has to be the obvious choice to visit, and it is indeed the most impressive hall by far, being flanked by two smaller halls, both connected by a sort of bridge structure. 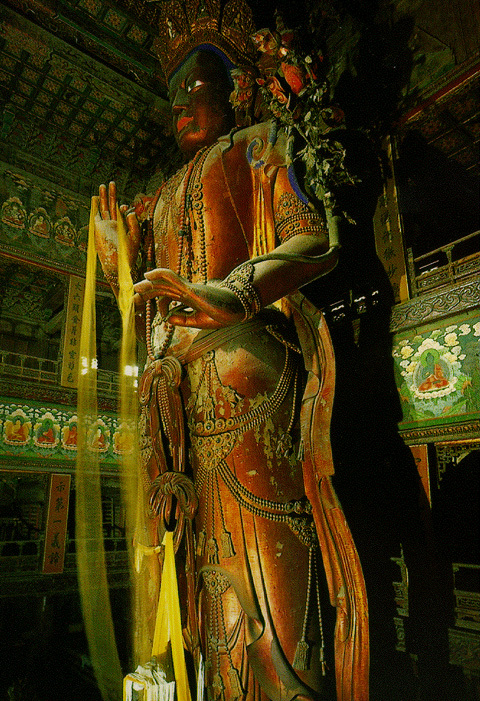 Inside the big hall stands a massive statue of Maitreya Buddha. Standing 18 metres tall, the main part was carved out of one piece of white sandalwood, and is today the world's largest wooden Buddha figure. 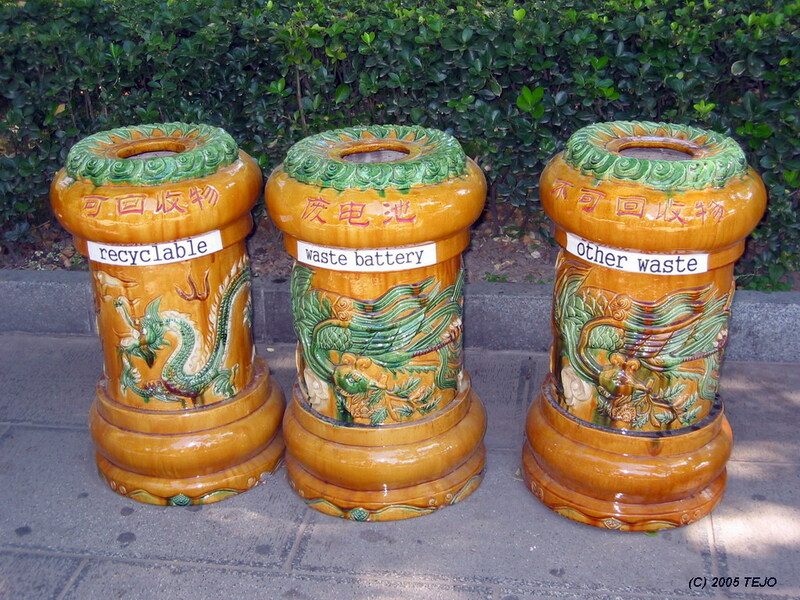 A couple of interesting points include the ticket, which also consisted of a small CD-rom with information about the site, as well as some peculiarly yet lavishly decorated waste baskets. 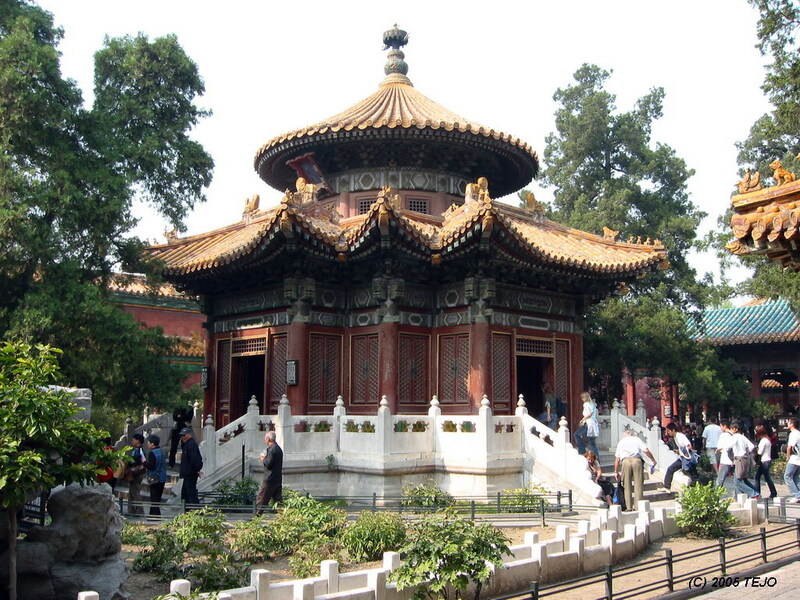 The Lama Temple is also a symbol for the Chinese government. With its somewhat unpopular attitude towards Tibet (claiming it belongs to them), they seem to try to show that they are open towards the country and their practice. The part of the park which was not turned into a book fair was another pleasant and quiet experience and was quite welcome after the cacophony of the restaurant which had turned out to be more of a giant café. Even the outside was pleasantly decorated, as we found out when deciding to walk the stretch back to the hotel (about 3 km), and people outside were playing badminton, which gave me a slight itch, as I have played it for years. China is more or less the world's leading badminton nation, and it is considered a national sport here. Day 4: We are getting good at this: Tian'anmen, The Forbidden City, Jingshan & Beihai - two days crammed into one! It was time to finally head to the absolute centre of the city: Tian'anmen Square and The Forbidden City. We started off with yet another taxi trip to the south end of the square, and after getting our bearings in the smog, headed towards the north. 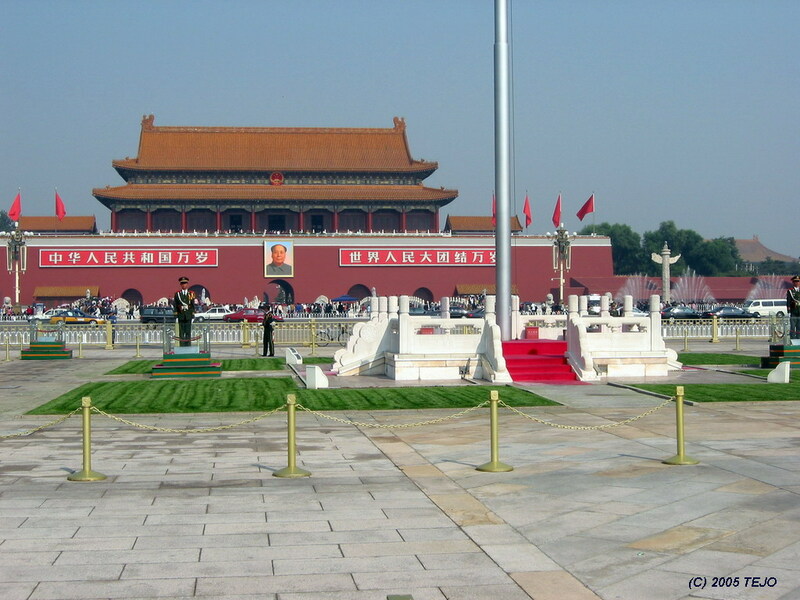 It was a long walk before even passing the mausoleum where Mao Zedong is buried, which marks the centre of the square. On either side of the huge square between the mausoleum and the broad avenue in front of The Forbidden City a couple of mammoth structures stand; on the west side is the Great Hall of the People (The Chinese Parliament), and on the east side is the Chinese National Museum, both typical communist mammoth structures. The only structures in the square itself, which measures 880x500 metres, are the aforementioned mausoleum as well as the Monument to the People's Heroes. On the north side stands a tall flagpost bearing the flag of China, which is well guarded by strict looking officers on constant patrol. However, as it was national day, the square was much more decorated than its usual self. 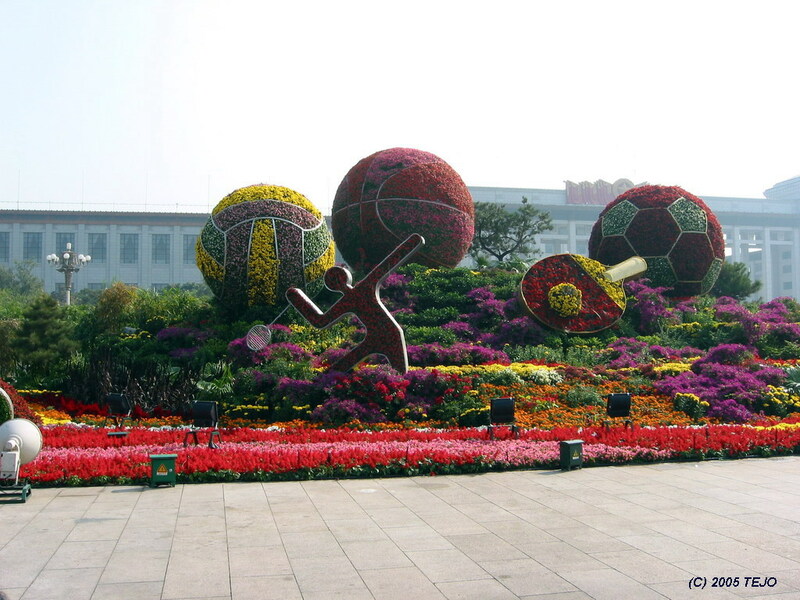 There were huge flower arrangements representing and reminding of the coming Summer Olympics in 2008, with figures or sport instruments (I particularly noticed the badminton player of course). Also, an impressive fountain was on display, which changed all the time into different patterns. In addition to this, a toy-size replica of a temple area or something similar could be spotted on the square's northwestern side. Getting to the first gate towards The Forbidden City was a bit of a walk as well. The avenue between Tian'anmen and the gate is 36 metres wide, and pedestrians walk underground to navigate to the other side. 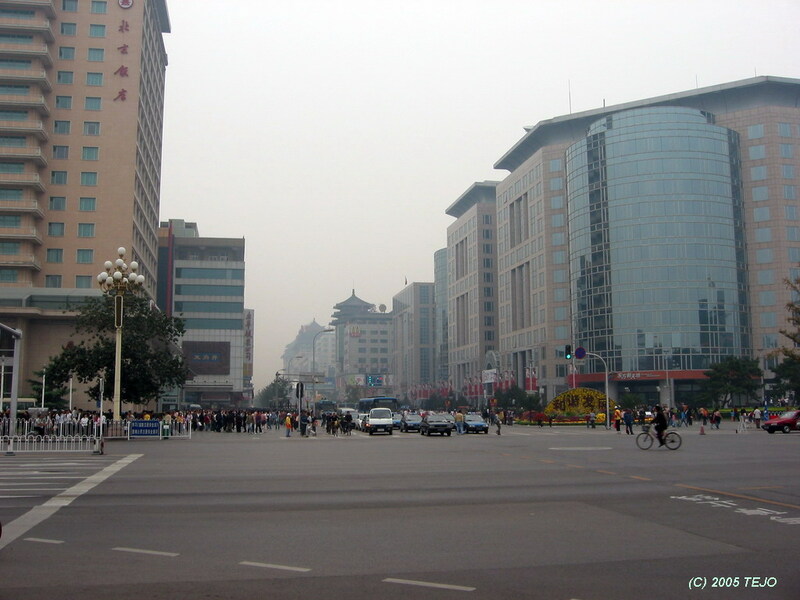 The square was built in 1417 during the Ming dynasty, enlarged more than once later, then finally in 1949, yet is perhaps most known for the student protests in 1989. There are two proclamations, one on each side of the portrait. The left one reads "Long Live the People's Republic of China" (and it was indeed from this place that Mao proclaimed the creation of the Republic on October 1st, 1949. The right sentence reads "Long Live the Great Unity of the World's Peoples". Two lions guard the five bridges crossing the stream in front of the gate - these lions appear in many places, and are believed to protect humans from evil spirits according to Chinese tradition. 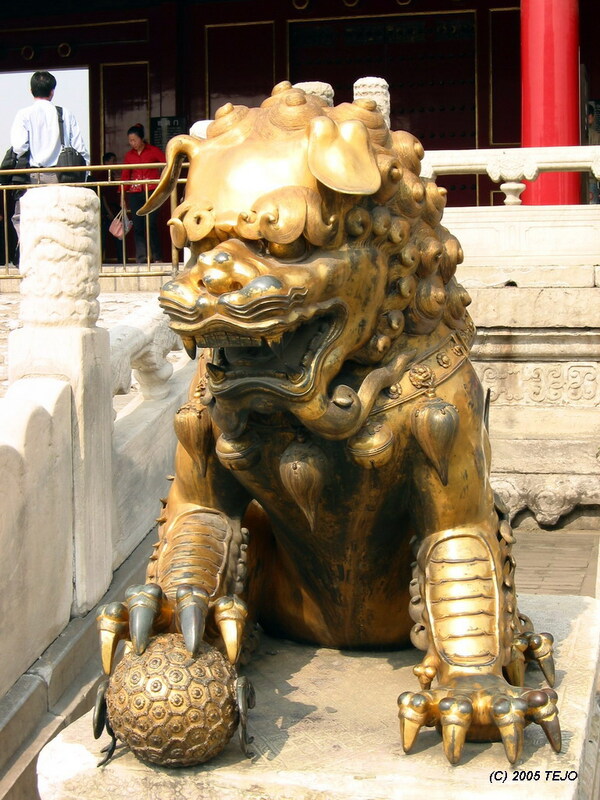 They will also often be seen with one paw on a ball or globe, believed to represent the union of Heaven and Earth. In some places, a male and female lion appear as guardians, where the female rests her paw on a cub, representing motherhood and protection. Once past this gate, you are greeted by...another gate! 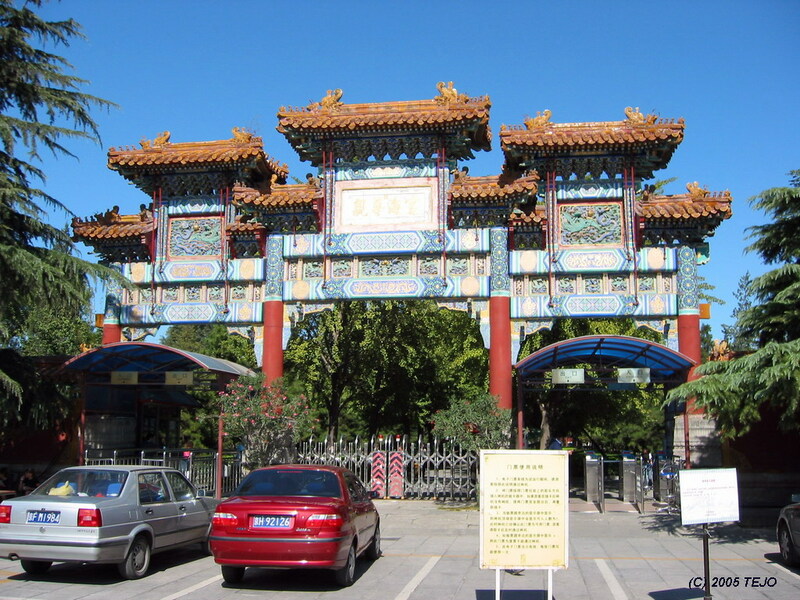 This gate, Duanmen or Upright Gate, leads after a bit of a walk to the actual palace gate, Wumen or Meridian Gate. Before entering here, you will have to obtain some tickets, and this is where things get interesting...bear in mind that with the numbers of people coming here, you may have to stand in line for quite some time before getting to the actual counter that sells the tickets. 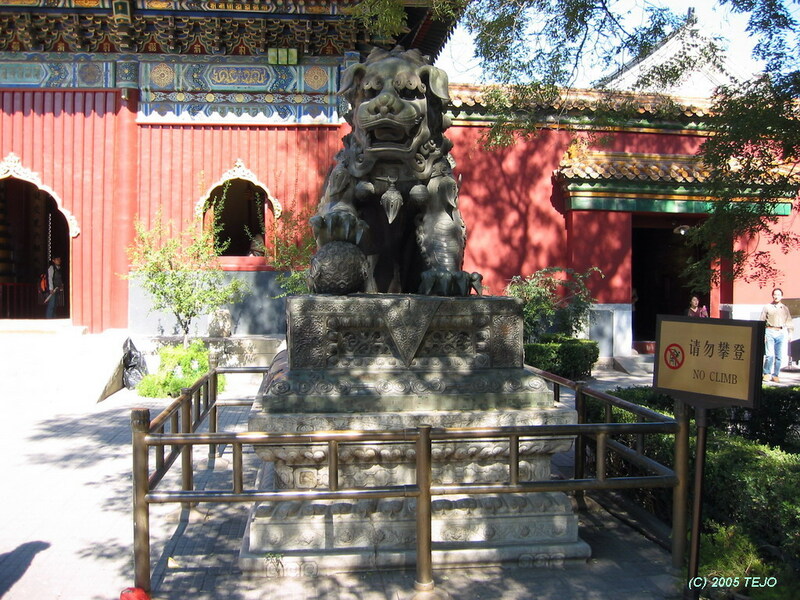 Once you are done with that and can enter the Forbidden City proper - whoah..it is actually much quieter once inside. Welcome to 720.000 square metres of palace area, which is a mirror of itself east-west, as its original construction followed strict guidelines, where everything was centered on a north-south axis. No building outside the palace was permitted to be taller or grander. Much of the original structures have fallen victim to fires over the years, as the wood was highly flammable. At some time, huge water basins made of copper were added so as to have some measure against the flames, and some of these are visible today. 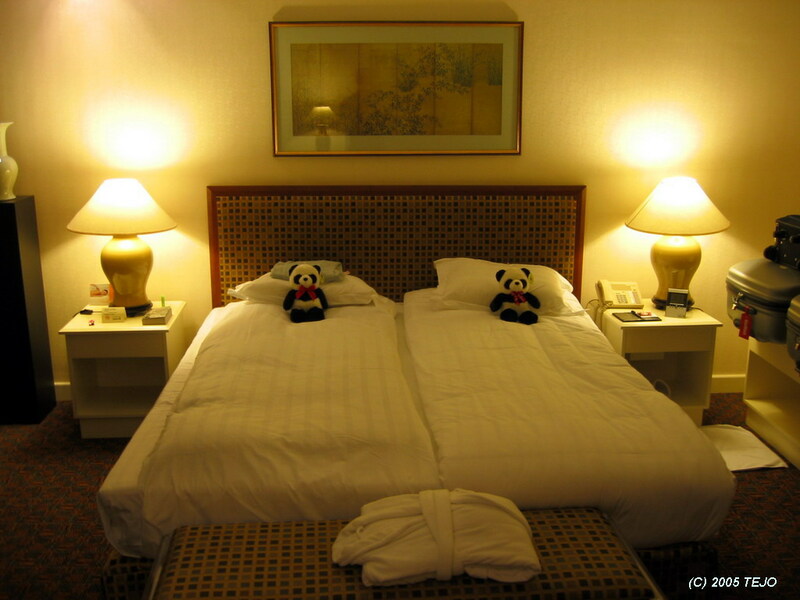 The palace is sometimes jokingly referred to as the "place with 9.999 1/2 rooms", since only Heaven has 10.000 rooms. 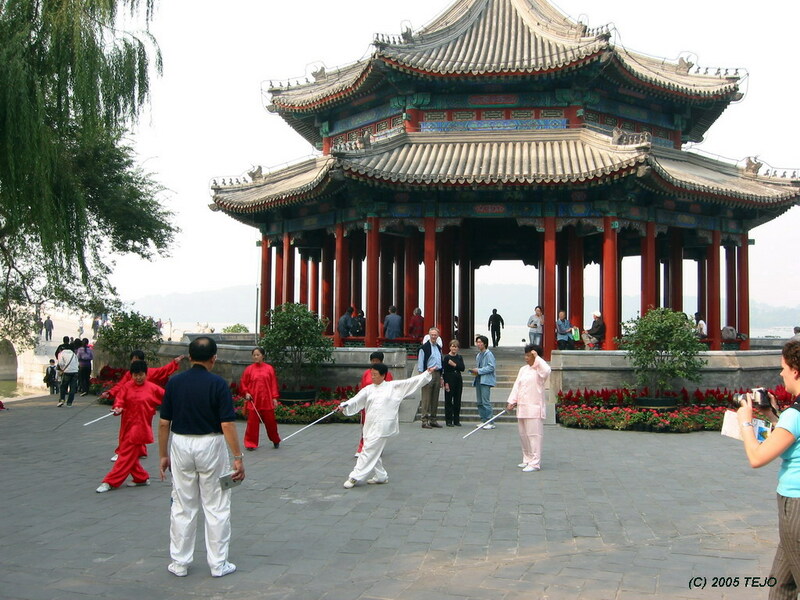 According to Insight City Guide Beijing, the palace "only" sports 8.706 rooms and halls. 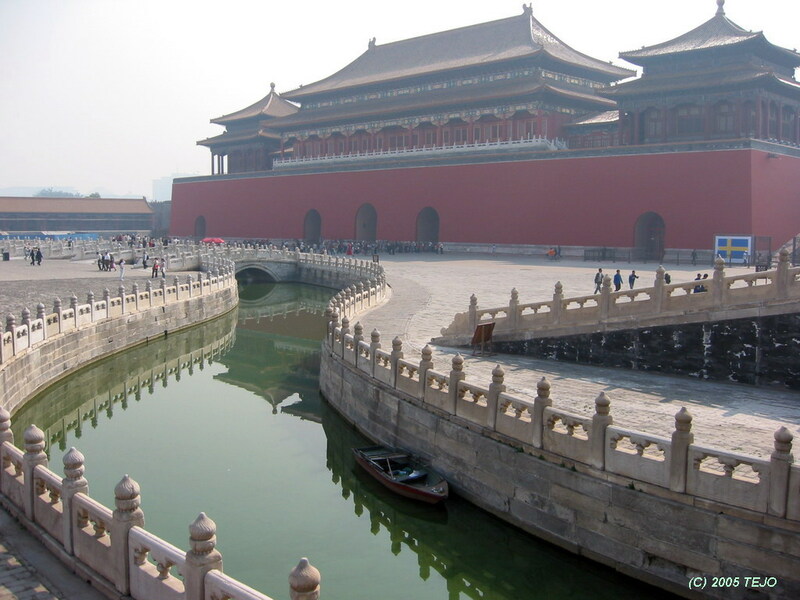 The Forbidden City was the hallowed place for the Chinese empire for nearly 500 years, and was completely off-limits to ordinary citizens, hence its name. Still, the area was not dead, as at some point up to 9.000 servants and eunuchs milled about the halls, corridors and open places. The maids usually only served during their teenage years, while eunuchs were "conscripted" for life, and their footsteps, high voices and (some said) scent of urine was all part of life in the enclosed city within the city. The emperor's concubines were also cut off from their families and the rest of the world, doomed to spend their days sewing and awaiting the emperor's pleasure. The Mongols of the Yuan dynasty built their palace a little to the west of where today's Forbidden City is located, before moving the capital to Nanjing in Central China. 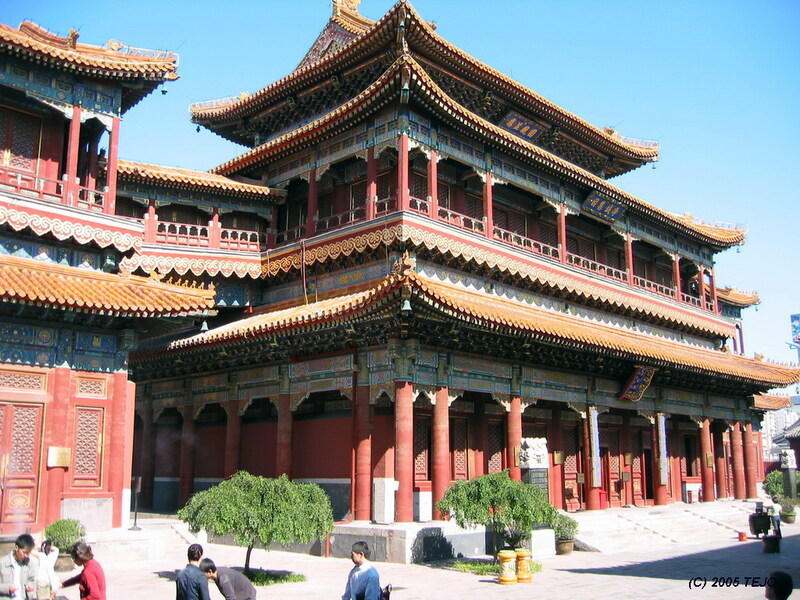 In 1403, emperor Yongle decided to move the capital back to Beijing, and ordered a new palace to be built. Between 1406 and 1420 around 200.000 people were involved with the building of the palace, which was finished in 1421. The empire was to last until 1911, when the 'child emperor' Pu Yi abdicated, yet he lived in the rear parts of the palace until 1924. The first tourists were allowed inside during the 1920s, but the palace was not much to look at in those days. 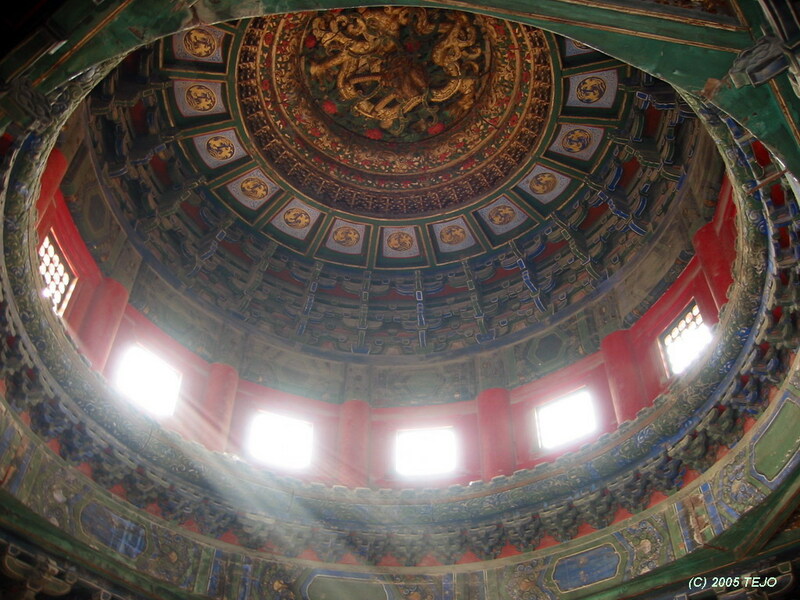 After 1949, extensive restoration work was done, and in the years leading to the 2008 Olympic Games, the palace (and other structures in Beijing) will undergo major restoration work. Indeed, this was clearly visible, as most of the east side of the palace was closed off and covered in plastic and/or scaffolding, while the west side was clearly restored and so shiny one would scarcely believe the paint had dried yet. Once through the Meridian Gate, several bridges cross the internal Jinshahe (Golden Water River). A recommendation is to head outside one of the side doorways for a breather from the crowds outside before continuing towards the actual palace grounds. 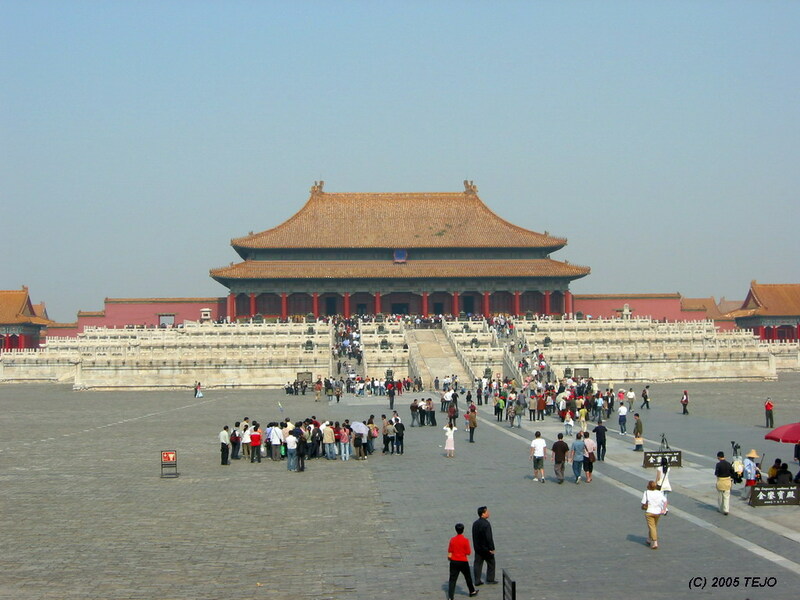 Once past the Taihemen (Gate of Supreme Harmony), a large courtyard stands between the visitor and the actual emperor's seat - Taihedian or Hall of Supreme Harmony. 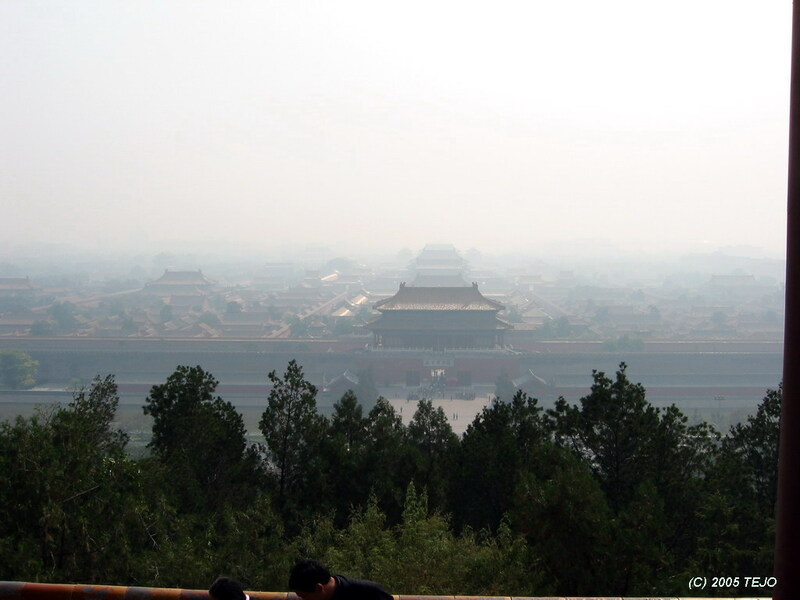 This is the structure one would find on any postcard with greetings from The Forbidden City, and is easily recognised, even on a hazy day. It is 35 metres tall, and the roof is perhaps the most impressive part of the building. It has a horizontal ridge, four rooftrees and double eaves, and is packed with various ornaments and figures. It has the highest possible status of roof decoration - a man riding a bird, nine beasts, an immortal figure and a dragon. The dragons on the roof are 3 metres tall and weigh 4.5 tons each! Following this impressive hall are several more halls and gates, before you are finally led to a smaller and pleasant garden area, where pavilions, bushes and ponds dot the palace. This is the Imperial Garden, and one of the most pleasant structures was the Pavilion of Eternal Spring, inside which the light shone through the windows from above and created a dreamy-like beam of light at an angle downwards. Some of the signs around the palace were rather an amusing read when considering the English translation, yet very charming: "Cultural relics are irretrievable. Please be careful when viewing them" and "Relic protected - no scratch" were both successful smile-raisers. As the bird flies, the palace area is nearly a kilometre long, and the sight of the next avenue followed by the Jingshan or Coal Hill was a welcome sight to be honest. Since it was still not late in the day, we headed directly over and ascended the hill, which rises some 60 metres above the surroundings. The hill is built from the soil after the excavations from The Forbidden City, and the centremost Pavilion of Everlasting Spring has a splendid viewpoint over the palace complex as well as the lake area, and on a clear day (one without any form of haze or smog) the northern mountains are visible. 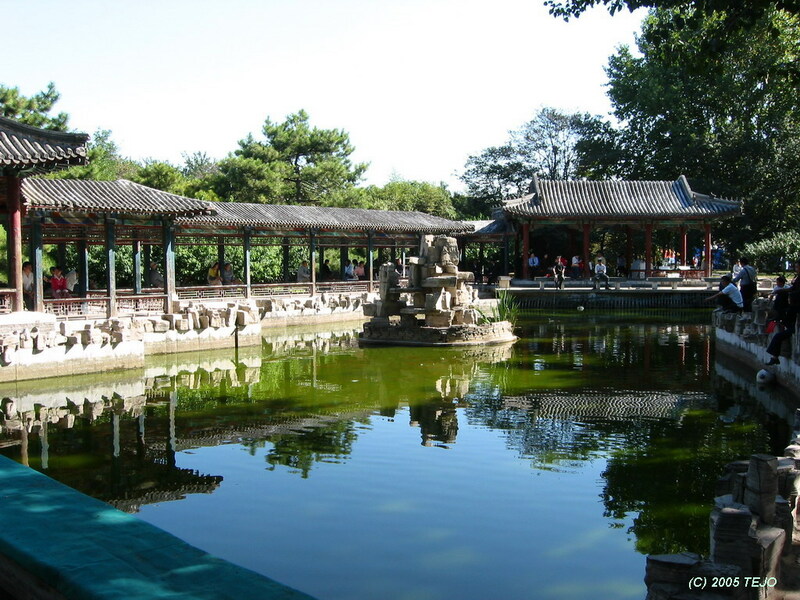 After this ascent, it was a short walk into the lake area north of the palace, known as the Beihai park. Just before entering the park, we passed by and checked out one of the more preserved hutong areas, which is part of the old Beijing and the way people used to live before the rise of communist silos. This area was charming enough, yet other ones were in dire need of either preserving or being torn down. This is a source of some controversy, as more and more of the old capital is disappearing. Yet, when seeing the badly preserved hutongs, one can only imagine the lack of hygiene as several families shared bathroom and toilets. During winter, the Beihai lakes are frozen, and locals enjoy ice-skating, while in summer, they paddle around in various boats. The area is yet another green lung of many in the city, and the natives seem to use them often. Most of the structures around the giant white Dagoba (built in Tibetan style on the ruins of a Ming palace in honour of the fifth Dalai Lama's visit to Beijing in 1651) were again closed for renovation, and it seemed obvious that we had a knack for finding such closed places. After the meal, we headed for one final sight before returning to the hotel, and one of the park's major attractions: the Nine-Dragon Screen. A premier example of Chinese glazed art, the screen is also the only one to be decorated on both sides, and was constructed in 1756. It was a most impressive sight and difficult to photograph, as it was quite a large structure: 25.5 metres long, 6 metres tall and 1.6 metres thick. On both sides, nine (notice a pattern here?) large dragons are playing with dragon pearls. The entire screen is decorated with 635 dragons of all sizes. As the two summer palaces, one old and one younger, appeared to be located near each other on the map, it was not hard to decide to cover them both in a day. 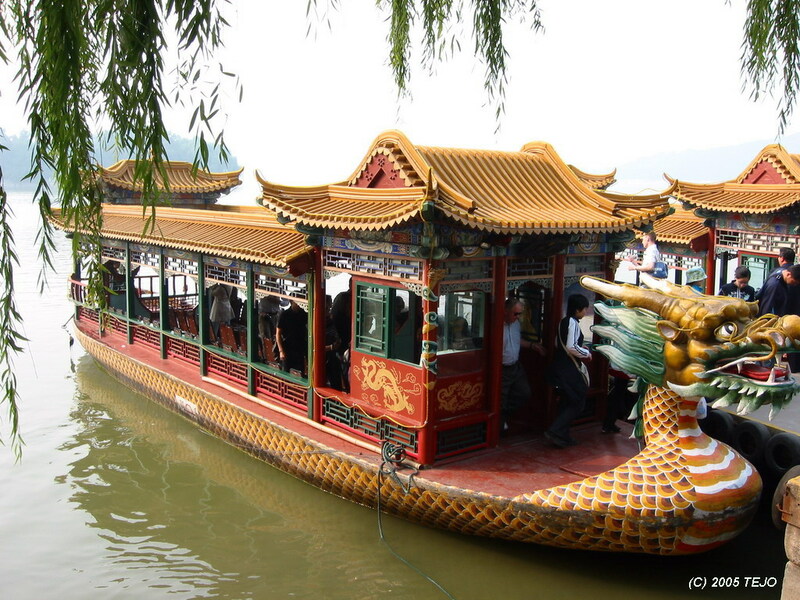 20 km northwest of the city centre, the new Summer Palace (Yiheyuan in Chinese), which we decided to start with, is a 2.9 square kilometre area, of which 3/4 is covered by the artificial Kunming Lake. 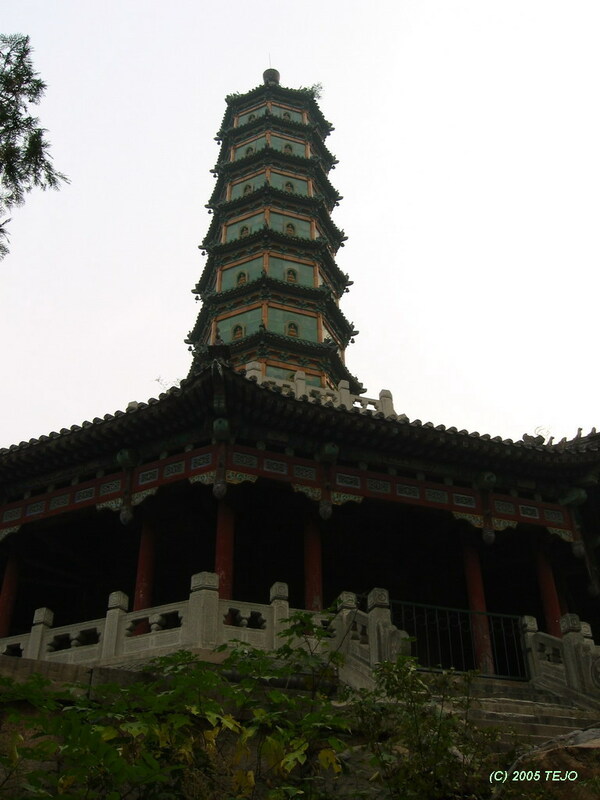 The other dominant feature is Longevity Hill, upon which stands Duobao Glazed Pagoda, yet the most impressive building is one nearer the entrance, the Tower of Buddhist Incense. The palace was originally more of a garden area, built in 1750 and added upon later. In 1860, both the new and old summer palaces were razed by Anglo-French allied forces during the second opium war. 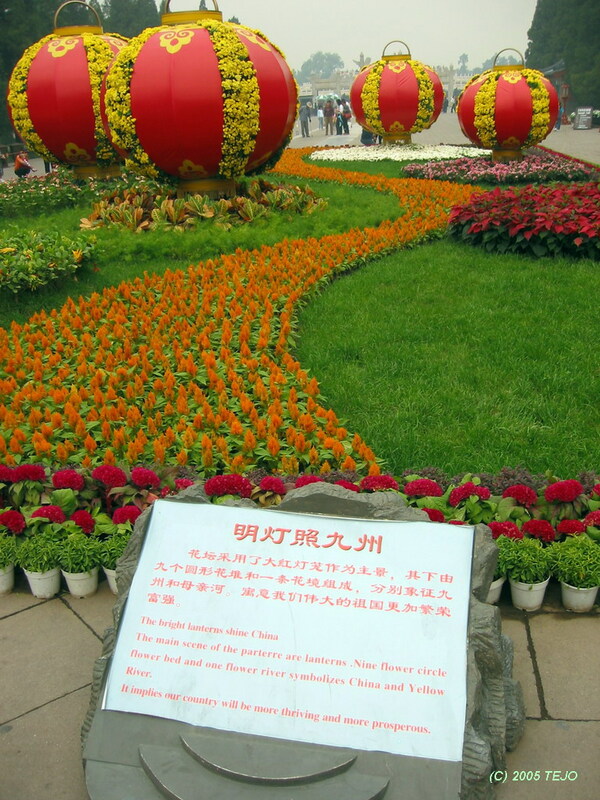 The garden was rebuilt in 1886, only to be razed again during the Boxer Rebellion in 1900, then again rebuilt in 1902. 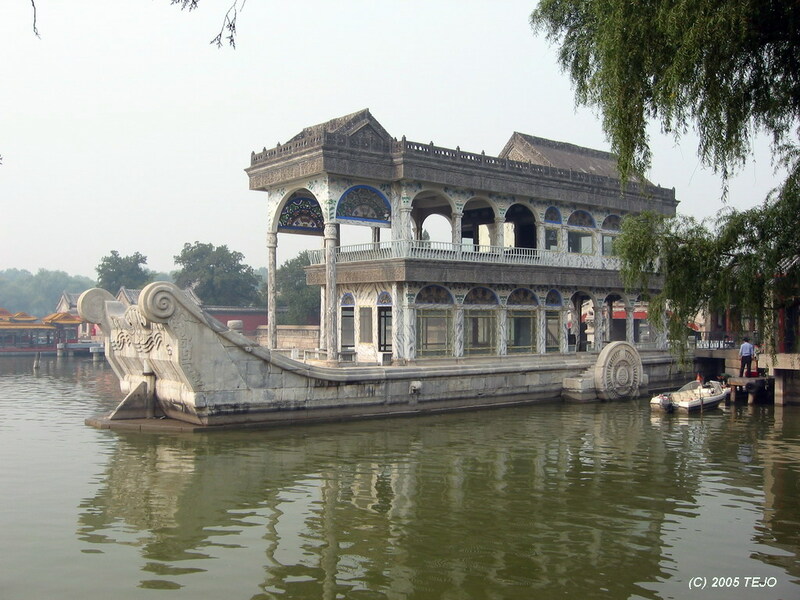 It served as a summer resort for Empress Dowager Cixi, who set aside a year's budget originally intended for the Chinese navy for reconstruction and enlargement of the palace, in particular the famous marble boat, which is a very impressive structure, sitting peacefully in the northernmost corner of the lake. The Long Corridor also deserves special mention, as it runs the entire south side of the hill upon which the large pagoda stands. Its total length is 720 metres and it is decorated with different paintings all along (although I did not bother to check if they were all different). The Seventeen-Arch bridge crosses over to Nanhu Island. Close to the bridge stands a bronze ox sculpture, which according to legend was used to prevent flooding, and therefore may have been made as a symbol or protection from Kunming Lake flooding the Forbidden City. The lake, which has an average depth of just 1.5 metres, was dredged in the early 1990s, and 650.000 cubic metres of sludge was removed as well as 200 Japanese bombs which were dropped during their war with China in 1937-1945. The more remote areas of the park were much less crowded and a pleasant experience, however, the infamous Beijing haze (smog) had decided to re-appear after two days of blue sky, and the Duobao Glazed Pagoda was barely visible on the other side of the park. The time had come to try to locate the Old Summer Palace. According to the map, it seemed to be perhaps 500 metres from the entrance to the newer one, so we crossed below the 4th Ring Road, following a road sign which indicated the direction. 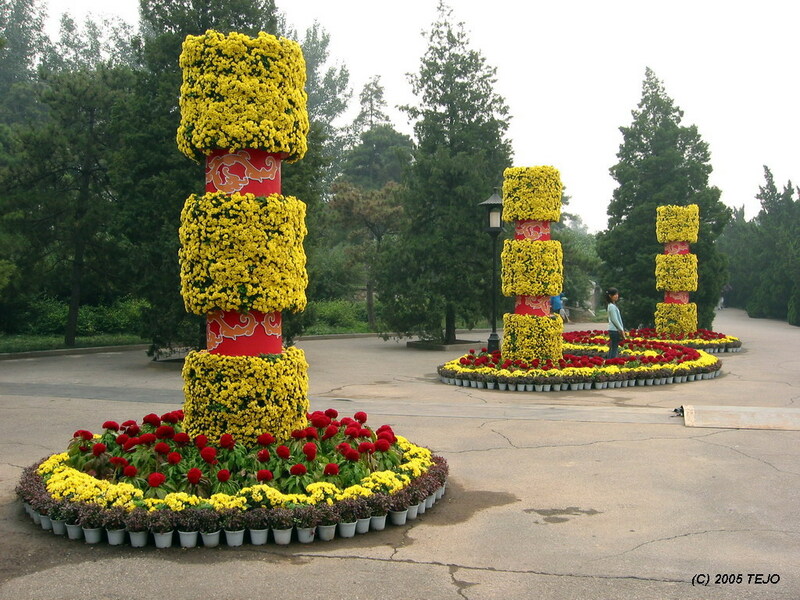 Its Chinese name is Yuanmingyuan (The Gardens of Perfect Brightness). However, finding it was easier said than done. I do consider myself as having some sense of direction, but the location or the entrance of the Old Summer Palace remained hidden after several map consultations and looking around to get our bearings. No further road signs apart from the one located near the 4th ring road were to be found either. It should be added that many entrances to parks are much less apparent than one would expect, and layout of streets and such changes rapidly in Beijing (which we would experience later as well), in addition to streets and blocks being so large you tend to lose your, so after quite a bit of searching, we gave up and started looking for a taxi to go back to our hotel instead. While waiting, we were approached by a somewhat dubious looking character who offered something that might be mistaken for food from the back of his cart. We decided not to take the chance to taste this stuff, as it was an unidentifiable block-of-something, yet after obviously not taking no for an answer, he got angry and threw a piece of it at us and left with fuming nostrils. 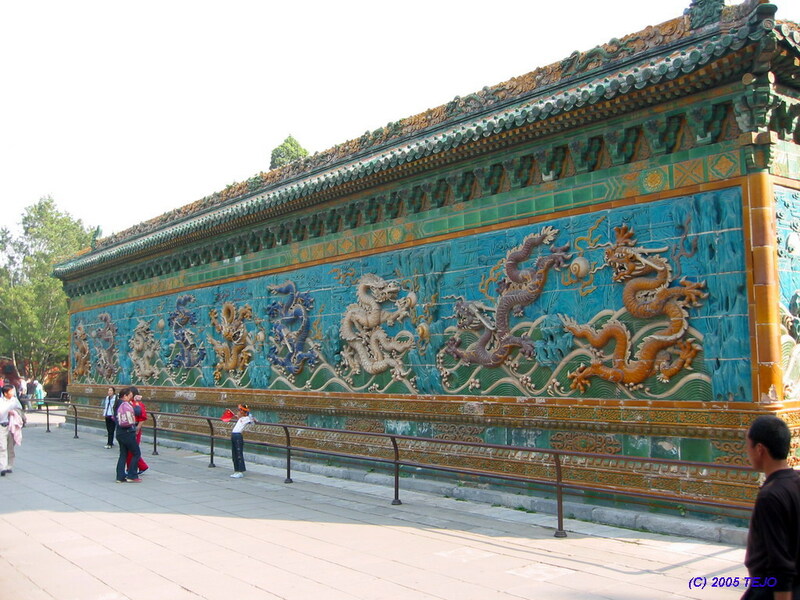 The Old Summer Palace has an interesting history however. Built on a much grander scale than its successor, it was constructed in 1707 and later enlarged over a period of 150 years (in the end it was twice the size of the New Summer Palace), with a small part added containing replicas of European palaces. In 1860, this place was pillaged, razed and burned by allied English and French troops. One of the participants described the event: "...You can scarcely imagine the beauty and magnificence of the places we burnt. It made one's heart sore to burn them; in fact, these places were so large, and we were so pressed for time, that we could not plunder them carefully". Victor Hugo had a different description of the actions that his fellow countrymen did: "Two robbers broke into this museum, devastating, looting and burning, and left laughing hand in hand with their bags full of treasures; one of the robbers is called France and the other Britain". Some plans may exist to rebuild the palace to its former glory, yet it is opposed by others, the reason being that it should remain as it is, reminding the Chinese of their more recent history as well as teaching future generations about the price of being dominated and humiliated by foreign powers. It was time to visit the panda in the local zoo. 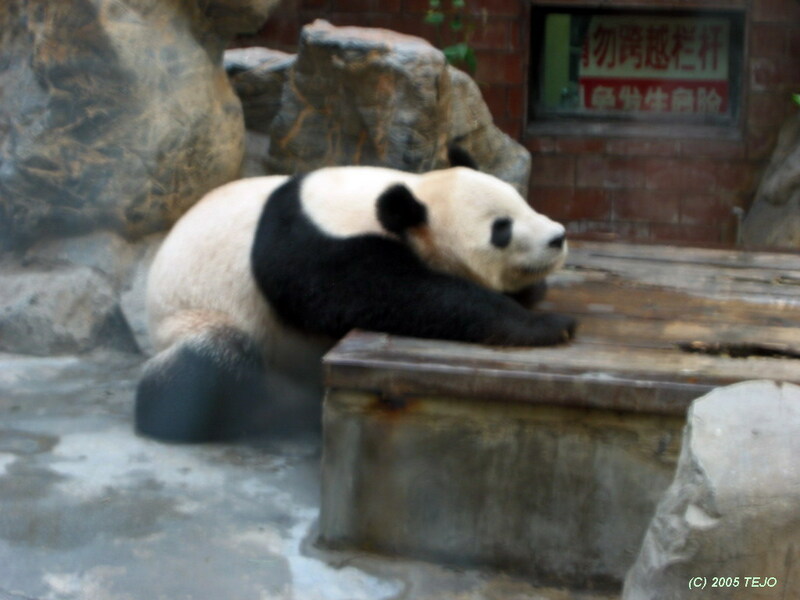 There was a separate entrance fee to get to the panda house in addition to the regular fee to enter the zoo itself. Frankly, the panda house was a bit of a letdown, as only one or two teenaged pandas could be seen, and didn't seem too interested in putting on an acrobatics show. Parts of the rest of the zoo was interesting enough, with several species of exotic birds, a few nicely constructed compounds and ponds, while the big cat compound (at least the cages inside) seemed to bother the cats greatly, as they paced back and forth, growling restlessly. 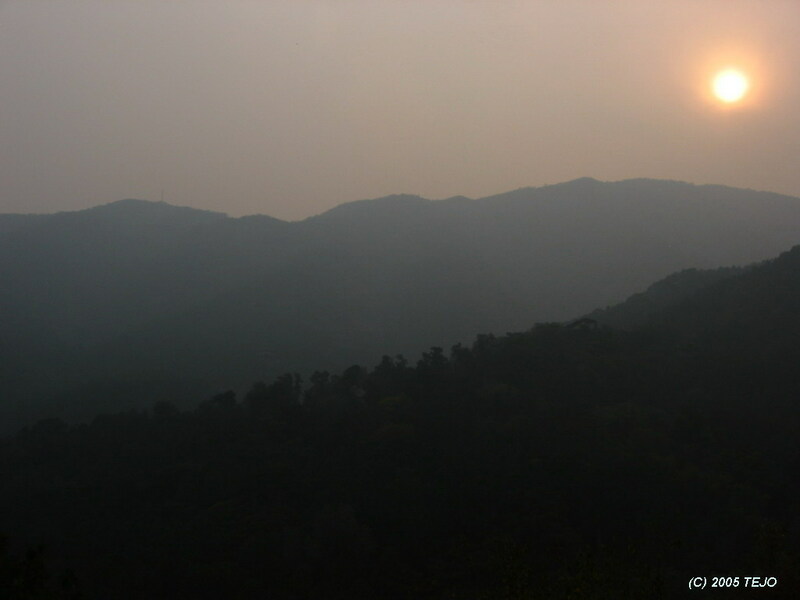 From the zoo, we hijacked yet another cab to get even further afield - the Xiangshan Gongyuan or Fragrant Hills park. The name does not come from any pleasant odours in the area, but instead the fact that the hill which marks the highest point of the park looks like an incense burner from one point of view. It lies some 30 km from the city centre, and whatever your means of transportation, you will stop at a large parking lot which still lies almost a kilometre from the actual entrance to the park. From here, walk along the narrow road that will take you to the entrance along countless small shops and stalls that will give you a taste of the more rural parts of the country. It was definitely an experience with all the smells and sounds, and there were no pushy vendors there at all, as westerners seemed to be a rarity in this somewhat remote part of the city. Indeed, we seemed to be somewhat exotic to a group of students, who seemed a little embarrassed to ask if we could join them in a photo. Then again, perhaps they just thought we looked strange. Again, the 'V' sign seemed to be common. The park is huge and after the flat entrance area, soon gives way to some much more rugged terrain. In fact, the summit of the park is 557 metres, from which on a clear day the city is very visible. There are steep slopes and deep ravines everywhere, making it more than just a casual stroll, yet a cable car brings the lazy tourist to the top in some 20 minutes. The origin of the park dates back a thousand years, when the Liao dynasty built villas in the area as a means to escape the heat of the city. 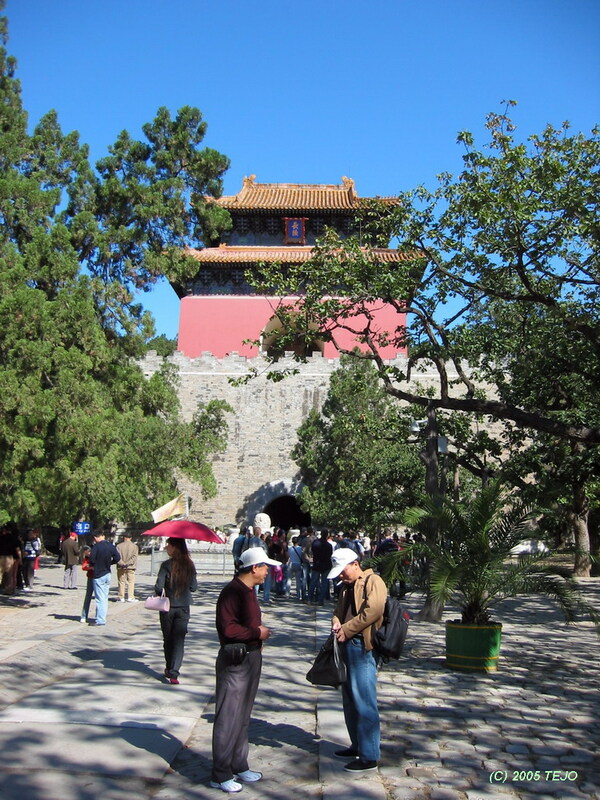 During the Ming dynasty, the area was a game reserve. 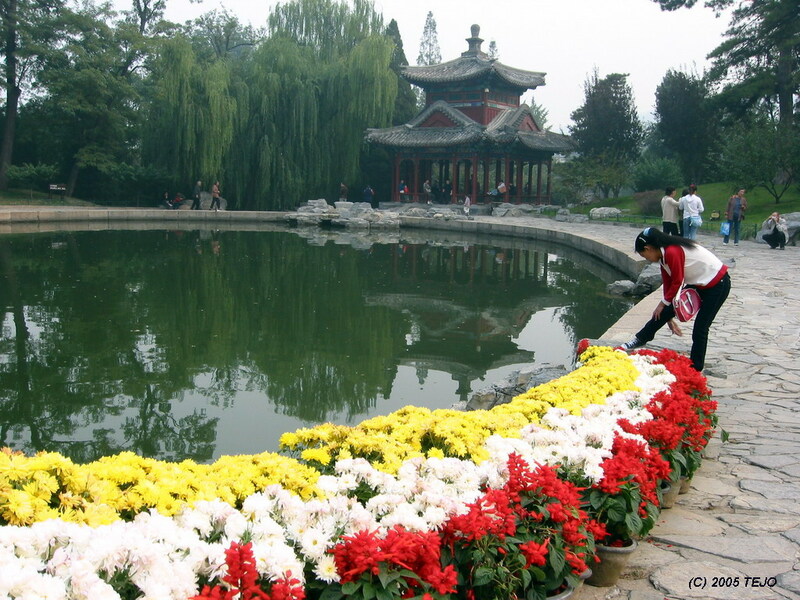 It was later turned into a landscaped park with 28 scenic zones, and was named the Park of Tranquility and Pleasure. Again, the park was razed and damaged badly for fun by the infamous 1860 Anglo-French troop rampage, then again in 1900, and few of the buildings have survived. After major restoration work, the park was opened to the public in 1956, and is today a very popular spot both in the spring when the flowers are blooming, in the summer when the area enjoys a lower temperature than the city itself, in the autumn when the leaves turn red as well as the winter when the hills and trees turn white. Noteworthy buildings include the Glazed Longevity Pagoda, which sits on top of a steep slope not far from the entrance. It was built in 1780, is 30 metres high, and consists of seven stories. Bronze bells hang in various places, which give a pleasant tinkling sound whenever a breeze blows. It was of course burned down in 1860 by English and French troops, and finally restored in 1956. To fully explore the park would take the better part of a day, as the alternative to the cable car is a two-hour ascent by foot, which we did not have time to (and the haze was again too thick for it to be worth the effort). Just north of the park lies another exotic building, the Temple of the Azure Clouds, which can be seen from the cable car and the summit. We decided to head back to the hotel in the late afternoon, as the sun was already setting by now, then after a short rest take a taxi to a recommended restaurant according to the leaflet from our own Kinareiser - Berena's Cafe. This would be our dinner place for the last two days, and we ended up regretting that we did not 'discover' the place sooner. Even though the interior is hardly chinese - more Parisian in style, slightly dark and gloomy, the food was amazing and the service of equally high standard. Free dessert, chewing gum and a rose to my mother as thanks for visiting was all included. In addition, they even ran out and fetched us a taxi for our return trip. At the time of visiting, the cafe was located next to the Worker's Stadium near the embassy area, but was supposed to move shortly after. The final day was set aside for a bit of souvenir shopping. 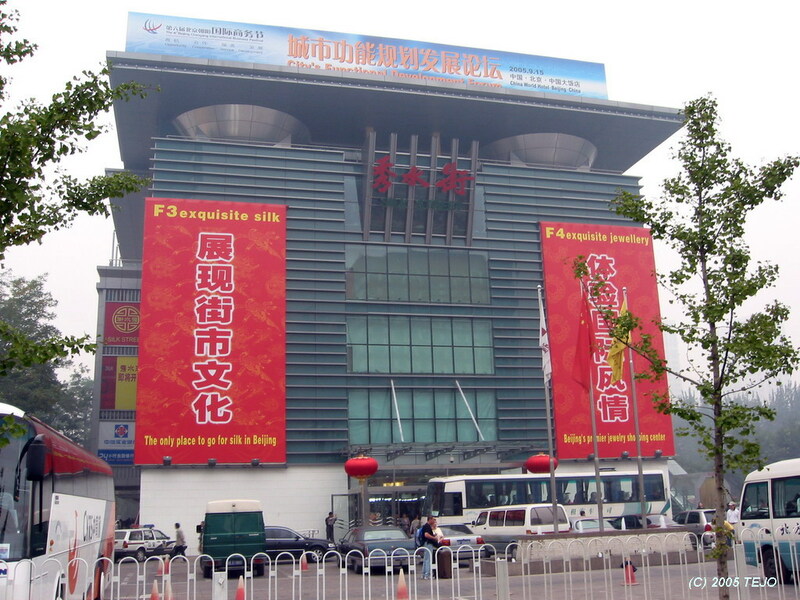 We went to the Silk Market, which is now a new building as opposed to the previous open-air market. It has 5 stories above ground and 3 below, making it a shopper's paradise. As we were not looking to shop clothes till we dropped, we instead went to the neighbouring Friendship Store. Here, we found a few interesting things, and I ended up bringing back a pair of small jade lion figures as well as a cloisonné dragon figure. What was surprising was that I got a rebate on the lion figures since they were sold in pairs - I hadn't expected government run stores to have anything but fixed prices. 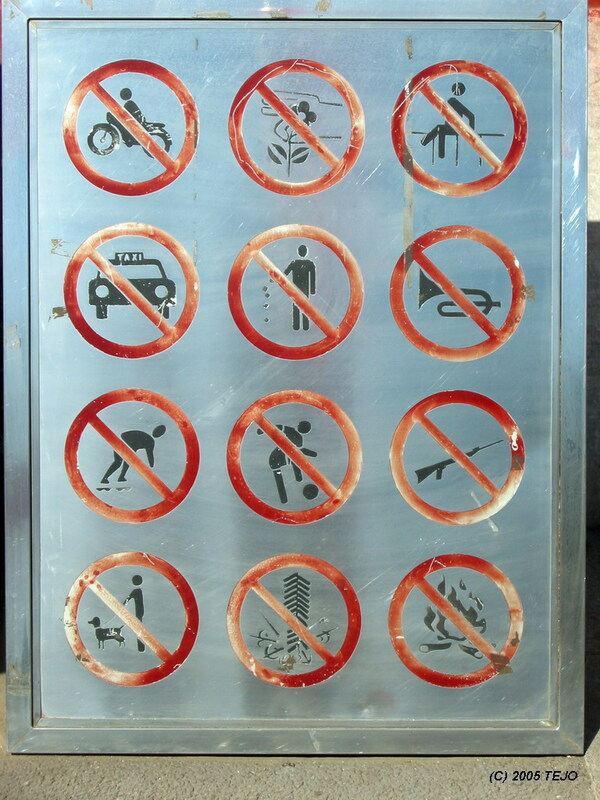 Again, the workers there would not press you to buy anything, as it seems they have strict policies about this. Calligraphy was ridiculously expensive - well over $100 for a relatively simple sample (no rhyme intended) was way above acceptable price. On the outside however, private salespeople gang up for an assault the minute you exit your means of transportation. For some reason, socks and watches seem to be predominant. Some of these salespeople can be a tad annoying as they won't take twenty-seven no's for an answer. Lunch was done in the nearby Pizza Hut (of all things), which was enjoyable enough apart from the thick rim of cheese on the outside of the pizza. We decided to follow the map and walk in a straight eastward line to sample more of Beijing on foot. We passed by a hospital, where they seemed to have placed a patient strategically on the sidewalk, yet this one made a big and painful impression. He was placed in a small box and was covered by a blanket, and did not seem to have either arms or legs, so we decided to donate in the nearby jar. As he acknowledged our generosity, it was time to reflect over how lucky some people are, and how unlucky others are. Things we take for granted, especially luxurious ones, are but figments of other's dreams. The fact that we can even travel to see remote parts of the world is another example. Travelling to various remote corners of the world should give ample opportunity for some insight - if one is open to it. As our walk continued, we passed some construction work, and the road started curving away from the straight east-west line, which was in contrast to what the map said. We decided against trying to navigate around this obstacle, as we had already walked for nearly an hour since the Friendship Store, then took yet another taxi back to the hotel. The return trip went much easier, thanks to a flight with few people, meaning the chance to stretch out for a nap across four empty seats. SAS deserves special mention for its excellent service as well, as we were almost overfed on our way back. The return flight was 9 1/4 hours, yet it felt not nearly as long as the initial flight, perhaps also due to the fact that the "travel fever" had disappeared, and there were instead loads of impressions to digest. The return flight from Copenhagen proved to be a bit of a challenge however, as the flight leaders in Norway were on strike (oops, sick leave I mean) due to an internal conflict. It was nearly midnight before the drive back home from the airport commenced, and I must admit the idea of going to work the day after was not too tempting, though I somehow managed - at least it would be a friday. Expect lots of people. 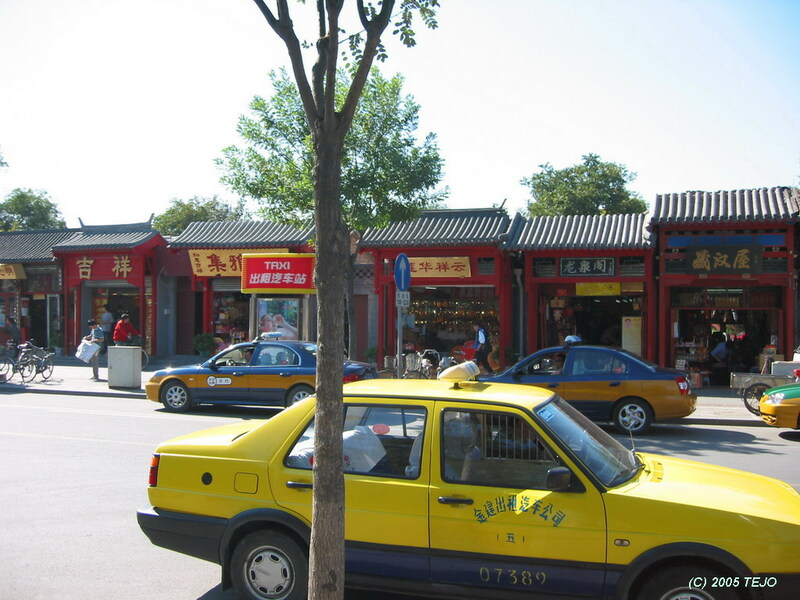 Beijing is home to somewhere between 9-12 million people, depending on who you ask or where you read. It is also a very large city - the entire county or commune is 6500 square kilometres. This often means long lines and wait times when going to various attractions - especially during the national holiday week after October 1st. To get around, the easiest way is just to use taxi. 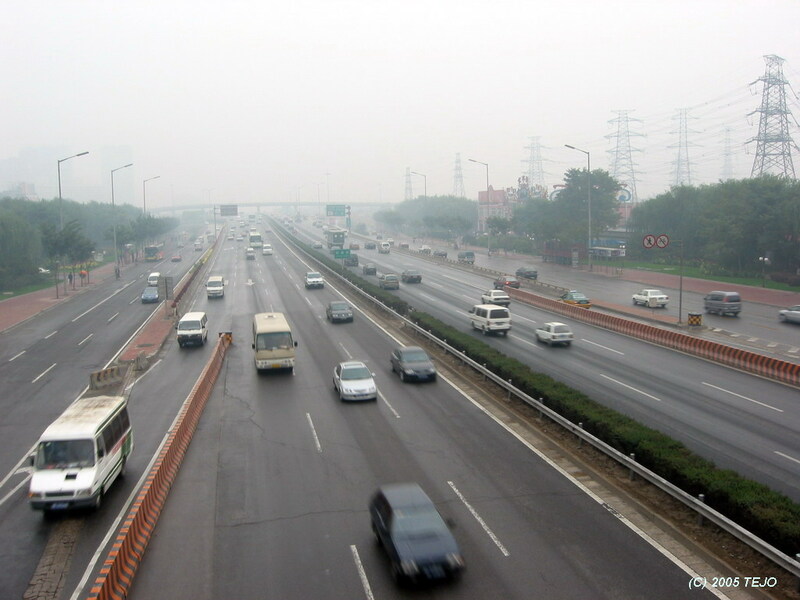 Beijing is crawling with them, and most drivers are decent and will not try to trick you. Stay away from unregistered ones - legal ones will have a sign and the driver will have identification papers on his dashboard. There should also be a visible meter, and the cost of driving is relatively small - expect a start fee of 10 RMB, then it costs either 1.20, 1.60 or 2.00 per kilometre depending on the car - a red sticker on the window informs about this. Many roads have long physical barriers between directions, so you may have to expect a long detour to get back to your hotel - this does not mean your driver is trying to give you the "scenic route" back. We experienced this on one occasion, where we ended up on the wrong side of the road at our hotel, and the driver was seemingly explaining to us in Chinese that he couldn't get to the entrance and had to make a long drive to get back on track - he even offered us to pay less in the end, which we refused, since it was a good idea to reward this somewhat surprising honesty. The subway is a cheap alternative to get around. It should cost 2-3 RMB per trip. The downside is that the network is not very extensive (only two lines exist, with a third underway and plans to extend it until 2050 exist), and there is not much of Beijing to be seen below ground. Buy sealed bottled water - not at your hotel, but at your local grocery store, where the cost is perhaps as little as a tenth of what you might have to pay at your hotel.